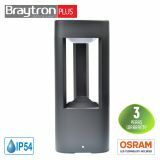 BRAYTRON is an international brand specializing in LED lighting with 15 years experience in producing and distributing high-tech lighting solutions on four continents. BRAYTRON is an excellent brand developed in consultation with a specialist in energy saving. They focus on designing, producing, developing and distributing all kinds of energy-saving lighting products, mainly focusing on ice lighting solutions. They offer a wide range of LED lamps, LED tubes, LED panels, LED spotlights, LED strips and more. 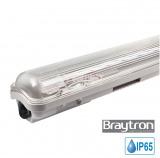 BRAYTRON products use high quality LED chips and components. All BRAYTRON products are produced after extensive research that guarantees energy saving and affordability. They strive to be among the world's pioneers in the development and diffusion of this technology. BRAYTRON manages factories in Romania and Turkey with a modern production base equipped with high-tech production lines and a modern research and development center. VIKIVAT Ltd. is a wholesaler and retailer of a variety of lighting solutions and products brand BRAYTRON. We offer stocks of LED bulbs and other products of the company, providing discounts for quantities and special preferential prices for wholesalers, flexible conditions and fast delivery! LED tube 1200mm, 18W, 230VAC, 1750lm, 3000K, warm white, T8, single ended, BA52-21280 One-sided LED tube Braytron 1200 mm long, 18 watts power consumption, luminous flux 1750lm. Ideal substitute for tradional fluorescent tubes up to 36W. LED strip 24VDC, 120LED/m, 20W/m, IP20, 4000K, natural white, BS01-00611 Flexible LED strip PLUSLINE with 120 LEDs per meter. Power consumption 20W per meter, supply voltage 24 VDC and cool white light. The price is for 1 linear meter. LED strip BS01-00610, 120LED/m, 20W/m, 24VDC, IP20, warm white Flexible LED Bracelet PLUSLINE with 120 LEDs per meter. Power consumption 20W per meter, supply voltage 24 VDC and warm white light. The price is for 1 linear meter. Automatic infrared PIR sensor, 220VAC, 800/150/250W, 180°, 16m, IP44, waterproof, BY31-01030 Automatic infrared motion sensor / PIR / model BY31-01030 with control relay for switching on of a consumer (electric appliance or lamp) for convenience and energy efficiency. 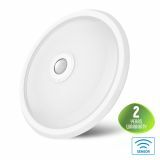 Automatic infrared PIR sensor, 220VAC, 2000/500/1000W, 120-360°, 16m, BY31-01010 Automatic infrared motion sensor / PIR / model BY31-01010 with control relay for switching on of a consumer (electric appliance or lamp) for convenience and energy efficiency. 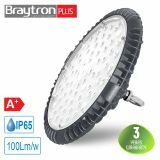 Waterproof spotlight fitting MITTO-IP, round, GU5.3/GU10, white, IP54, BH03-02094 Waterproof fixture for LED and halogen spotlight with GU10/GU5.3 base MITTO-IP from Braytron with protection degree IP54 suitable for installation in wet areas such as bathroom, toilets, WC. White color and round shape which makes it universal for residential and office buildings. LED ceiling lamp BULKHEAD-ELP, 12W, 220VAC, 840lm, 6500K, cool white, IP54, waterproof, BC16-00230, oval Exterior, oval LED ceiling lamp BULKHEAD from Braytron with wattage 12W, flux 840lm and bright, cool white lighting. Suitable for outdoor installation in balcony, warehouses, halls, stores, garages. IP54. Low energy replacement for 80W incandescent lamp. Non-dimmable. Manufacturer warranty 2 years. 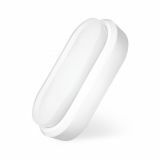 LED ceiling lamp BULKHEAD-ELP, 12W, 220VAC, 840lm, 3000K, warm white, IP54, waterproof, BC16-00200, oval Exterior, oval LED ceiling lamp BULKHEAD from Braytron with power12W, flux 840lm and soft, warm white lighting. Suitable for outdoor installation in balcony, warehouses, halls, stores, garages. IP54. Low energy replacement for 80W incandescent lamp. Non-dimmable. Manufacturer warranty 2 years. Wireless doorbell, 12VDC, 23A, 150m, BY30-02019 Wireless, electronic doorbell with wireless button Braytron BY30-02019 on batteries with a choice of several melodies. Wireless bell, 12VDC, 23A, 150m, BY30-02006 Wireless, electronic doorbell with wireless button Braytron BY30-02006 on batteries with a choice of several melodies. 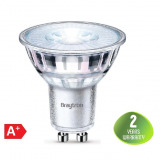 LED bulb 2.5W, G9, 220VAC, 240lm, 2700K, warm white, BA29-50290, capsule, glass G9 LED capsule light bulb from Braytron with power consumption 2.5W , luminous flux 240lm and soft, extra warm white lighting 2700K. Ideal substitute for halogen bulbs. Suitable for hotels, museums, shops, display cabinets, reception areas. Energy class A+. Non-dimmable. Manufacturer warranty 2 years. LED spotlight 4.8W, GU10, MR16, 220-240VAC, 360lm, 2700K, warm white, BA27-00550, glass Glass LED spotlight from Braytron with GU10 base, power 4.8W, luminous flux 360lm and peaceful, warm white lighting. Ideal for home, office, restaurants, hotels and public buildings. LED technology is completely harmless. Non-dimmable. For indoor use only. Manufacturer warranty 2 years. LED ceiling lamp ML300 with PIR sensor, 15W, 220VAC, 900lm, 3000K, warm white, BC15-00300 New, round LED ceiling light Braytron with power consumption of 15 W, warm white light and motion PIR sensor included. Easy and quick installation. No flicking and high efficiency. Build-in driver and motion sensor. This model LED ceiling lamps are suitable for stores, office areas and stairs. For dry conditions IP20. 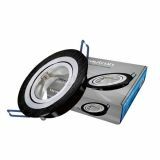 Spotlight fixture SPOTTI-S, black-silver, GU5.3/GU10, round, BH03-00161 Round, spotlight fitting SPOTTI-S from Braytron for LED or halogen spotlights suitable for GU5.3/ GU10 sockets in black/silver color. Suitable for installation in residential building, office area, restaurants, hotels, shops. For indoor use only IP20. LED Waterproof fixture AQUALINE 1x18W, T8, G13, 220VAC, IP65, 1200mm, single-side, BT05-11280 Industrial LED waterproof fixture for LED tubes AQUALINE from Braytron designed for 1pcs T8 LED tube with 1200mm lenght, 18W wattage and single sided connection. Suitable for main lighting in indoor and outdoor areas such as factories, halls, industrial buildings, grocery stores. Warranty 2 years. 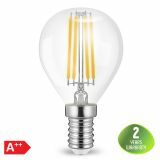 LED FILAMENT bulb, P45, 4W, E14, 220VAC, 400lm, 2700K, warm white, BA37-00410 Decorative LED lamp from Braytron with socket E27 and power consumption 4 W. Its beautiful design and soft light make it suitable for restaurants, hotels, galeries and art premises. The lamp is dimmable. List Price: 4.50лв. VAT Incl. Industrial LED lamp UFO HIGHBAY, 100W, 220VAC, 10000lm, 6000K, cool white, IP65, waterproof, BT45-19132 Powerful, 100W LED industrial light UFO HIGHBAY from Braytron PLUS with high luminous efficiency of 100lm/W. Suitable for industrial usage, in high ceiling buildings, warehouses, factories, malls, stores. It can be mounted on walls and ceilings. No flickering. Anti-glare lends. IP rating 65. Manufacturer warranty 3 years. LED garden lamp DALLAS-300, 7W, 220VAC, 500lm, 3000K, warm white, IP54, waterproof, BG43-02002, dark grey Modern LED post bollard light Braytron PLUS with wattage 7W, 300mm height and IP54 level of water and moisture protection. It offers soft, warm white lighting and can be mounted in gardens, parks, alleys. Suitable as well as an interior lighting for artistic areas. OSRAM LED technology included and warranty 3 years. LED strip ECOLINE 5050, 60LED/m, 14.4W/m, 24VDC, IP20, non-waterproof, cold white, BS01-00313 Non-waterproof, flexible LED strip light Braytron with 60 SMD5050 LEDs per meter. Power consumption 14.4W per meter, power supply 24 VDC and cold white color of lighting. The price is for 1 linear meter. List Price 3.99лв. VAT Incl. 3.79лв. VAT Incl. LED COB track light SHOPLINE-B, 15W, 1180lm, 220VAC, 3000K, warm white, BD30-01001, black body Black LED COB tracklight light from Braytron with power consumption 15W, luminous flux 1180lm and warm white lighting. Suitable for accent lighting at hotels, restaurants, galleries, fashion stores, beauty salons. For indoor use only IP20. Non-dimmable.